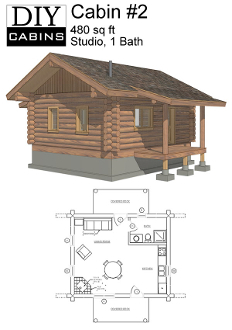 Log Cabin #2 is a 480 sq ft, studio cabin with 1 bathroom. Designed using a 10" average log, this cabin is small yet comfortable. Designed with a hide-a-bed in mind, this cabin is a very simple "back to basics" cabin. This cabin also has (2) 6'x13' covered porches; one front and one back.